The Telecom Regulatory Authority of India (TRAI), while refuting reports about possible increase in cable TV and direct-to-home (DTH) bills, had said that its new framework may actually decrease TV bills. The statement came after a research note from CRISIL said that the new norms would result in higher bills for the cable TV and DTH subscribers. Many consumers are saying that their TV bills are going up after 1 February 2019 for viewing the same set of channels. 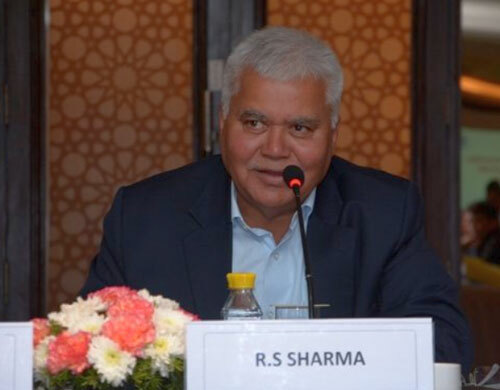 Addressing the media in New Delhi, TRAI chairman Ram Sevak (RS) Sharma said that the report was prepared on an 'inadequate understanding' of the TV distribution market and it was incorrect. "The report is based on choosing top-rated channels on all-India basis and considers only one weekly report dated 25 January 2019, from TV Rating Agency, BARC. The report is not based on detailed and focused analysis, supported by data. This report is more likely to mislead the subscribers while they are likely to migrate to new framework and would results in misunderstanding," a statement issued by TRAI said. TRAI secretary SK Gupta said: "In three months, we expect prices of various channels to go down." 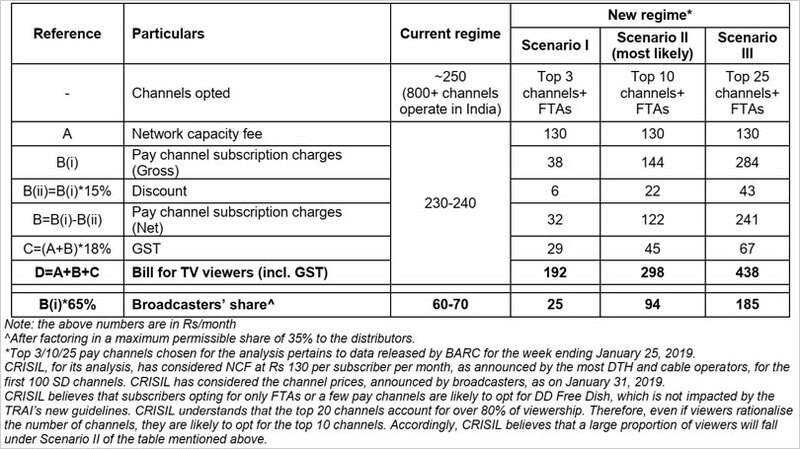 In the report, ratings agency CRISIL had said, "The network capacity fee (NCF) and channel prices announced by broadcasters and distributors as per the TRAI's new guidelines could increase the monthly bill of most subscribers of television channels." The new regime, which came into effect on 1 February 2019, will benefit popular channels and hasten adoption of over-the-top (OTT or content providers who stream media over the Internet, such as Netflix and Hotstar) platforms, and will be a mixed bag for viewers and distributors, the ratings agency had said. The regulator however, claims that its preliminary data analysis shows a reduction in TV bills. It says, "These are early days and detailed data-sets will be available only after a few weeks. Yet, the Authority has information from few large distribution platform owners (DPOs) and the preliminary data analysis reflects actual savings by subscribers to the tune 10% to 15% in metro towns and between 5% to 10% in non-metro (DAS3 and DAS4) areas. Many consumers on Twitter, however, are saying that their TV bill has gone up after the new changes become effective on 1st February. One Pinku Dey (@PinkuDe79114044) says, the new regime has given extra burden on common people. "…new pricing system of cable TV & DTH service do not work. It gives extra burden to the common people. Because monthly bill is increased. Early my monthly bill was Rs200 & now it crossing Rs300 with lesser channels. Please change the system," he says. @TRAI Pathetic decision and changes by #TRAI. TRAI also clarified that as per the regulations, service-providers even waive off or give discounts to consumers on the network capacity fee-NCF. Mr Sharma said that the regulator has received several complaints from consumers regarding blackouts on DTH platforms, and offerings of multiple TV connections which TRAI is looking into and has issued necessary guidelines to the operators. Talking about second connection in the same home, the TRAI has said, it received complaints about issues over price for the second TV connection and had sought details of special schemes for provision of the second or subsequent connection. "The Authority expects that DPOs will declare special policies/ schemes for multiple connections within a TV Home in a day or so. TRAI is having close watch on it and intervene if so required," it said. Even with the Tamil Nadu Govt's Arasu Cable TV, the rates have increased nearly 40-50% for selecting the option to watch the popular channels which are priced at the maximum for different languages. I was paying Rs.150; now I have to pay Rs.300; and that too for shody service. 1.People collectively avoid big pay channels then their price would come down. 2.Pay channels do carry full advertisements like Free channels, not sure why.